I love, love, love the Advent Calendar figures. 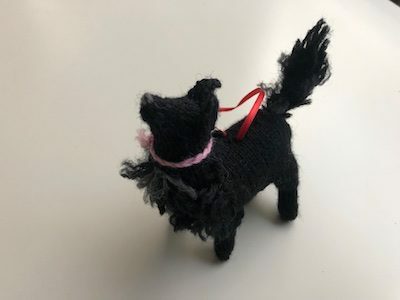 A story you might find amusing – one year, I knit my mum some little sock ornaments, because she loves ornaments and because her Christmas socks were going to be a little, um, late. When the little sock ornaments were opened, all the witnesses, my mum included, thought I was trying to hint that I had a wee one on the way (I didn’t). Good fun. See??? Waiting for “perfect” isn’t necessary! If it were none of us would ever cast on!. We’d be still waiting! Thank you Rams!! I like this and vote yes. We don’t get Jeopardy here in England, but I’ve seen it a lot on USA films and tv programmes, but what a great idea! Could be a hoot. OH good. You’ve gotten over the first hurdle – writing the first post in a long while. Now you’ll just have to make a habit of it, again. Rams is right! All posts are good posts. Short or long, I am always happy to see a new blog! I love the snippet posts! Carry on in any way you can! You forced my to finally open an Instagram account because somebody said you were posting more things there. Maybe that’s a good thing? What a lovely keepsake for any child! What about putting all the Advent Calendar patterns together with a pattern for the calendar itself, and sell it as a big, more expensive pattern? Bet it would sell. I would pay an outrageous amount for that pattern! I was just about to suggest this…a book/let with all the patterns for the ornaments! I would love to buy them too!! I found this comment by searching for control-f for pattern. I’d be in for that! Sooooo adorable. There might be difficulty getting all the permissions and copyrights? Glad to read your post…I miss you terribly when you are ‘away’. The Advent pieces are wonderful and a keepsake forever! I’m sending this post to all my children to prove that once in a while I’m right — but really, it was selfish (I missed your company) and a case of judging others by myself. Well, and knowing that “Finished is better than perfect” doesn’t come naturally to you. NOTE: this does not mean the next post has to be big either. Welcome back, petal. You nudge so gently, my dear. I was thinking of busting in her door and holding The Stash hostage. And I dearly love you both. I’ll second that! Thanks all! Greek approach, Norwegian approach. When circumstances permit, we make a good team. Dearest Rams and Presbytera, I confess that as soon as I read any of Stephanie’s posts I scroll quickly through the comments looking for your names. So glad to hear/read all three of you today. Thanks, Our Lady Rams of the Comments, you’ve saved the sanity of The Blog. Hey, it’s winter, we need the Harlot. You aren’t alone! I always do the same. And I was thinking the cold in MI finally made you so stir crazy that sending a message to Steph was a final call for help. Thanks for nudging Steph into posting and be glad you won’t be in MN next week – a week below zero. And I second the request for an Advent calendar of patterns. Thank God, Rams! I was getting withdrawal symptoms. I’ve been taking a creative writing class. I’ve always wanted to write down the stories in my head and now that I have time, I find that writing corporate documentation and policies has screwed up my brain and while I can TELL a story, I can’t seem to WRITE a story without it sounding like a computer policy, so I’m taking a writing class… which has nothing to do with anything except the first day I had an AH HA! moment. If you can tell a story, couldn’t you record one and then transcribe it? Just to get started? I used to say the very same thing, Mary, but took a writing class and found a writing book that said something like, “Artists sketch, musicians practice, athletes workout, so what makes you think that just because you know the language you can write a decent story?” Which is why I use a book of prompts or an art gallery calendar and write a quick prompt before turning out the light every night. Gotta keep my writing muscles in shape. Oh, and I also heard that you have to write a pile of bad writing as high as your head before you get something really good. I figure I’m at about my shoulders after 17 years. Good luck in your class. “Perfect” is the enemy of “done.” I’m hanging on to this. Applies to lots of things. Mimi’s post. YH – we missed you and your posts, long or short are always perfection! I Love Love Love the little animal ornaments!!!!!!! We miss you when you are not here with us. I was wondering about you this morning and thinking that it had been a while since you posted. Glad you’re back. I’ve missed you – and Rams & Presbyteria! The Advent calendar is adorable. Penny the dog!! Great to have you back. Elliot has excellent instincts: I can TOTALLY relate to the desire to kiss those adorable ornaments, especially the mouse and the snowman!!!! Your Advent calendars are so darn cool. That little dog is amazing. It inspires me to try it myself – thank you! You see your last paragraph there…I think you’ve forgotten what it’s like to have small children. That’s how I end every email and conversation…the children are done being quiet and I really must go. You must be in a new season in your life that requires imperfect, short snatches of posts. I bet you’ll get good at them. So glad to see you! The little ornaments are terribly charming. I am drowning in admiration for how you pull that off time and again. I think I’d get stalled around Dec 4. I”m so happy to see you here again! I know for me, posts from you do not have to be big, or exciting, or anything you maybe think you should write. I miss you when you don’t write. I miss seeing your family. I miss seeing your knitting. I miss your thoughts on life. I hope you will write again soon! Hugs! Yes, to all that. I have been worried about you, and after every day without a post I started saying a little prayer for your joy in life to return. We all need that to stoke our own joy. Together, we can tilt the bent of the Universe toward Joy. Short small blog posts are great! We readers welcome your posts anytime. Thanks for the advent calendar photos. That is an incredible work indeed. Oh my goodness those are all so wonderful I can hardly stand it. Elliot is perfectly right in kissing each one. We should all have a Lady Rams. So lovely to see you back! As yet another sufferer of the what my Dad calls “making the best be the enemy of the good” I empathise with you. And i love your posts, long and short, and the individualised Father Christmas is particularly special. I really understand the babyproofing by grandparental vigilance. Small grand daughter morphed from baby to toddler in about a week, suddenly the baby gates on the stairs are not nearly enough prevention. Thanks for that. It doesn’t have to be perfect to be a blessing. We enjoy what you have to say. Thank you! I’ve missed you. Instagram just isn’t the same as the blog. 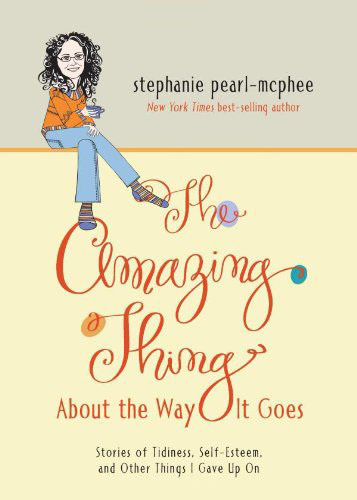 Stephanie, love the post, and you don’t have to be perfect for us. I think we all know that life can get complicated. I think we’re all also really grateful you share your life with us, and your knitting, and you, and we’re not going to think, Why aren’t all the links in her post? We’ll just be like, yay, Stephanie! 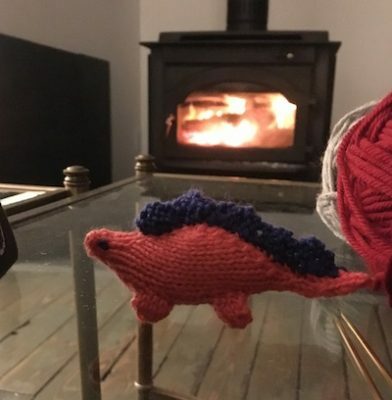 Adorable knitting! Also, thank you, Lady Rams of the Comments. I really, really love the kind of people that hang out on this blog. Hugs and happy new year to everyone! It’s great to hear from you. I always remind myself that reading your blog is a privilege and not a right. 🙂 .Love the knitting! Yes, I tell myself that too. It’s good enough…and delightful. Thank you, and thank you Lady Rams for the encouragement. Your posts are like “fun mail!” Fun mail is a warm note from a friend, a knitting catalog or magazine, a package you’ve been expecting–anything that makes you say “Oh YES! !” when it comes. It’s something that I look for every day. It doesn’t come every day, but when it does, fun mail often makes the day! Thanks for the post. The Advent calendar ornaments are terrific. Done is good, perfection is for the birds. Welcome back, lovely to hear from you & we all hope you are well. LOVE the advent, especially the snowflake. Nice to hear from you…there need be no continuity…stream of consciousness is also good..matches our own thought process…and I love to hear what is going on with you, given that some days it matches what is going on with me! So glad you are back — life intersects continually! Relieved that all is well for you and yours. You are good enough. More than good enough. I’m sure I speak for others as well when I say we enjoy the snippets, you don’t need to fill us in on all the things. We love you and your writing so much because what we crave isn’t perfection, it’s connection. Even Martha doesn’t pretend to utter perfection any more, and it makes us hate her much less. Nothing you can write will let us down, you’ve built up some immense goodwill and honestly you should trust yourself to deserve to use it. Thank you for dropping us a darling imperfect line. Well, shoot. Now, instead of just watching for a new post I’m also going to have to look for a Rams or a Presbytera comment. So much more work. Pssst.Ctrl+f, then type in the word. Missed your posts; welcome back! I’m loving reading the advent-cheers of Elliot. We just need a little bit of Yarn Harlot every once in a while so we know the knitting world in not out of kilter. Such a cute advent calendar! Such a sweet post. You’re sharing love and joy with us. By that standard, there is no “wrong” blog post. Thank you for sharing what you can with us! Enjoy your time with Elliott, we’ll wait and love what you post next when you have time. 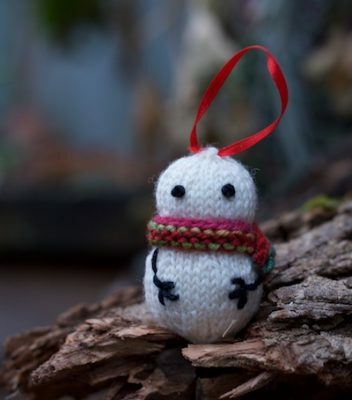 I thought the mousie was the most adorable thing ever, but then there came the snowperson. Yay for a post, and Ram’s really really right about a short, imperfect post being very welcome. Thanks! Welcome back Steph! So glad to see your post! Never worry about what you say, how much you write! We’re always so glad to read whatever you do post!!! Your adoring fans will greatly read and enjoy anything you post. You know that feeling you get as a mother when you don’t hear from your kids in a long time? You picture them trapped in their car, in a lake, upside down! That’s the same feeling I get when I don’t see a blog post from you in a long time. So glad everything is fine and you’re just busy! You’re forgiven because Elliot is way more important. Welcome Back!! We missed you. If experience with little boys counts for anything, my guess is that Elliot will continue to find dinosaurs fascinating for years to come. When you hit post a wave of positive cosmic energy moved across the globe. Small or large a sharing from your keyboard helps keep something right in the world. Thank you. Thank you, the post was perfect! It let us know you were alive and well and provided pictures of knitterly goodness that both enticed and entertained. Glad to see you back! I’d figured you were dealing with a bad combination of Toronto winter and unfinished X-mas gifts. Still, glad to see that Rams can still deliver a good, swift kick, even via e-mail! The advent calendar ornaments are gorgeous. Would love to know what Penny thought of her “mini-me”! Happy to have you back! Any post from you is perfect! Love the advent calendar! Happy New Year! Your post is not only ‘good enough’. It is perfect! So lovely to read your words. Your advent pieces are amazing and thoughtful as always. Glad to have you back. And the Advent ornaments are wonderful. I am happy to read whatever you post — and I don’t feel like I need a complete recap of everything that’s happened since your last post. It’s your blog, and you post what you want. I adore all the ornaments you made for Elliott. I wish there were such a thing for people who don’t celebrate Christmas! Hey Sarah. 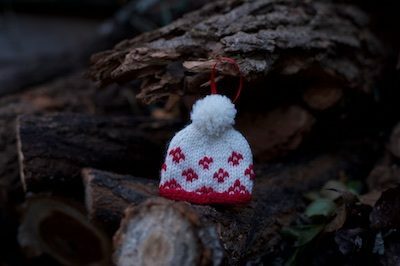 What about a knitted item of your choosing for each month of the year? 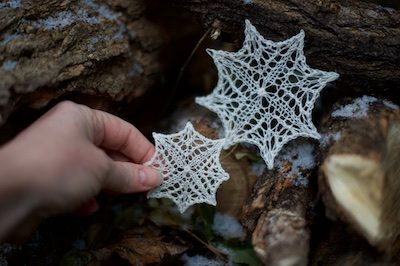 You could knit that adorable snow flake for a winter month and a little yellow sun for the middle of summer…Just a thought. We miss you when you’re away, but remember that not every post has to be the Great Canadian Novel. Sometimes a “hey, I’m still here, look at this thing I knit” is all that’s needed. In other news… I became a grandma over the weekend! My son’s daughter, Scarlett Joan was born on Saturday. She is a tiny little peanut at 6 lbs 8 oz. My other son and daughter and I drove 3 1/2 hours to see her. (the ride home was longer, as I got lost). Whee! Oh, and she’s too small for what I’ve knit her so far, so there’s a smaller sweater on my needles! Always happy to hear from you, whether it be in a short post, a long post, or just a series of images! I’ve been reading since the beginning and we have kids about the same ages, so it always feels like a friend is keeping in touch with me. Thank you for the post. Thank you for sharing so much of your life. You do not need to continue to do so, anything you post is actually treasured, I think. It does not need to be big, or magical or even explain an absence. Friends, even digital ones, that only know this part of your life, understand. I think The Blog is like an old friend. Maybe you don’t have enough time for a proper catch up sometimes, but a quick chat helps keep the chain of friendship intact and ready for the next chapter. Well, clearly you’ve spoiled us. We worry when we don’t hear from you. Thanks for checking in! The ornaments are adorable, BTW! Glad to have you back (and thank you Ms. Rams!)! Steph, you’ve got superpowers too. I hope you know that by now. And as much or as little as you post, it will always be a welcome sight. Steph, when you don’t/can’t post, we understand. We have been in dark places and scared places and overwhelmed places, too. 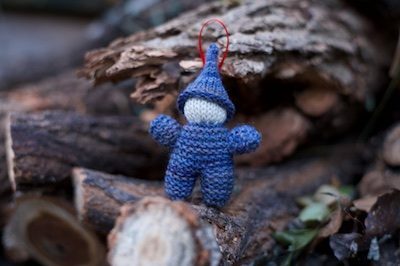 We treasure you just as you are, however and whenever you are, Knit-Sister. I love your posts whenever they appear, grandbabies take time and are much more important. Your wee advent treasures are adorable and will, I am sure, be a lifelong treasure. Nicely done Nana. Nicely done. I’ve been reading your blog for years, from all over the world and have missed you this month – glad you’re back! Stephanie, if your posts were perfect, you would not be honouring your Mom’s encouragement to not go around making your house perfect when company’s coming. So stay perfectly imperfect. You’re real that way. 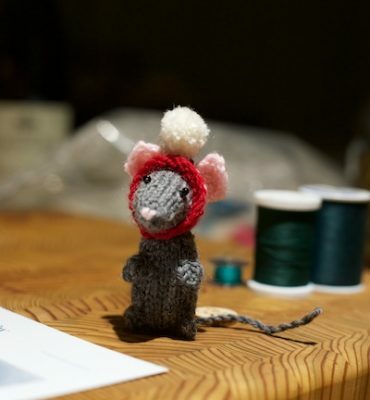 ooh – the little knits! Now they are perfect! Welcome back Steph! It’s always a pleasure to hear/see what’s on your mind, even if it’s been a while and you don’t tell us the whole story of while you were away. Drop in any time and The Blog will be thrilled! Amazing ornaments! And never, ever, wait for perfect, I was taught that by a very sage knitter. I/we miss you when you’re not blogging, but I/we understand that you have a very busy life and can’t always get around to us. And isn’t that why they invented Instagram? The advent ornaments are lovely. 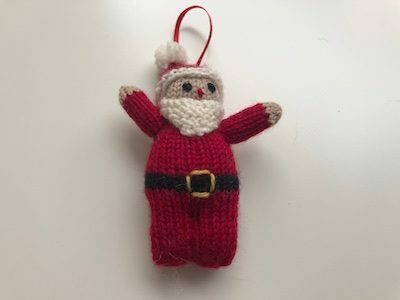 I’ve vowed to make some knitted ornaments for my 3 year old grandson since he kept pulling breakable ones from the tree and, well, breaking them. That Penny dog is amazing….totally worth the angst! Good to see…er, read….you again. 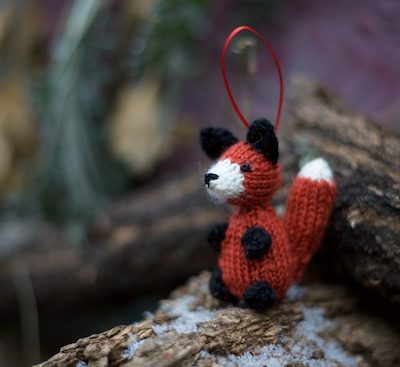 Love the Advent things, especially the fox. I am not at all of Native American descent, but I have studied much of the culture in recent years, and have an Indian (which they do of course still say) name – it’s miskowaagooshekwe ……..meaning “Red Fox Woman”. And truly, little red foxes poke in and out of my 81 (82 on 11 June) year-old life since. Which is rather strange for a gal who migrated to Minnesota 40 years ago from Chicago!! And……..I too pulled a non-starter from the sock sack for January – I have 12 single socks (a very bad case of single-sock syndrome, for sure) and this year I’m trying to remedy that. But the one I pulled was the penultimate I wanted to – it’s a lovely single sock with an intricate 2-color pattern designed by a talented sock yarn gal in SoCal. It’s been 5 years, and I can’t remember how to do the most frequent and decorative stitch on the blamed thing! I will have to email her and confess, seeking help. Because I must also get back to the short-sleeved pullover I’m about 2/3 finished with, for my Paris-based (38 years) daughter, currently teaching now for 4 years in Dubai, whom I will hopefully see again after those 4 years this summer, perhaps. Sorry for long post – I am another Gemini, but with a serious case of loggoria or however one says wordyness!!!!!!! Welcome back, Steph – and cour-age to you for the coming challenges. All I really need is … Hi! … That is all. I love more, but … Hi! … is all I need. We love to see and hear from you! Short or long, perfect or not! Thank you! Thanks for the post! Little snip-its of knitted-ness slightly past are truly accepted, loved and appreciated whenever and however they choose to present themselves to the blog. No expectations other than you caring for yourself and your family and being present with them! Oh those are so sweet! I love the detail. Thanks for sharing. Thanks for all your words and pictures. Always. Those little mice just get me every time. Please give mousie a kiss from me, Elliot! That was a wonderful post and I really enjoyed it – thank you. Gorgeous calendar! 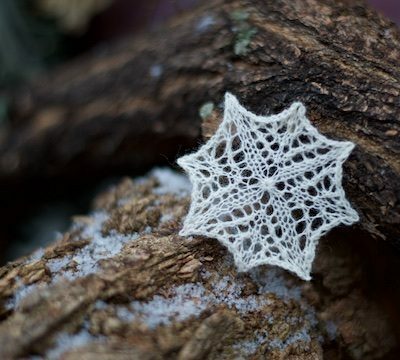 I love it so much when you knit wee things. Even a month after Christmas, they’re a special treat. I was hoping we would get to see the Advent knitting. Thank you for sharing! I have been fascinated with all things miniature lately, and these are perfectly perfect miniatures. I never get over how human you are!! Love you!! These are so precious! I would have loved to make these earlier, around the holiday season. Too bad I missed these! They are really, really cute. I love you and hope that you take this the way I intend.. but I feel scientifically compelled to point out that snowflakes always have 6 sides (or 12 if there is symmetry involved), but never 8. What you made is a pretty star, but not a snowflake. 6 pointed shapes are even more irritating to knit than 8 pointed shapes, and I’m sorry for that, but water makes crystals with 120 degree angles, regardless of our gauge.